Ask yourself what makes someone vote one way or the other, says psychologist Jonathan Haidt in his essay excerpted below. For example, why would someone – in this case poor, dispossessed – vote against the party that proposes helping them – in this case the Democrats – and for the party that smiles and tells them to help themselves, against increasingly difficult odds? And of course, everyone and his cousin has an answer: a chattering class is born with talking points, driving wedges, simplifying and clarifying, until all nuance and complexity and alternatives are bled out leaving two simpering dried up masses of ideology with a wasteland in between. What if you look closer, asks Haidt. And he goes to India to immerse in a different culture, and comes back with a new way of seeing the other side. People act in response to very deep motivations. Conservatives, says Haidt, fear uncertainty and change, and they see moral clarity as a means of regaining order and hierarchy. Haidt’s is a vanguard stance: recolonize the vast space between camps, and a new social culture will form – a reef – around ideas of complexity and nuance. Occupy the evacuated center. What makes people vote Republican? Why in particular do working class and rural Americans usually vote for pro-business Republicans when their economic interests would seem better served by Democratic policies? We psychologists have been examining the origins of ideology ever since Hitler sent us Germany’s best psychologists, and we long ago reported that strict parenting and a variety of personal insecurities work together to turn people against liberalism, diversity, and progress. But now that we can map the brains, genes, and unconscious attitudes of conservatives, we have refined our diagnosis: conservatism is a partially heritable personality trait that predisposes some people to be cognitively inflexible, fond of hierarchy, and inordinately afraid of uncertainty, change, and death. People vote Republican because Republicans offer “moral clarity”—a simple vision of good and evil that activates deep seated fears in much of the electorate. Democrats, in contrast, appeal to reason with their long-winded explorations of policy options for a complex world. Come for dinner, bring a bottle. Sounds innocuous enough: a host, some guests, an invitation, gifts, drinks all around, dinner, warm conversation — a social life. Lovely! Don’t be fooled. It’s not as innocent as it appears, says Margaret Visser in her book the Gift of Thanks. Underneath all the niceties, it’s a sinister dance. The host – who you would think likes the guest and enjoys his company – is watching, assessing whether the newcomer harbours violent intent. The guest crosses the host’s home’s threshold and there begins a process of ‘ritual domestication.’ Outside is wild and unpredictable; inside the space of congress and negotiation. Public life is a blank and life in the home everything. And nothing is ever what it seems. In languages that have developed from Indo-European roots, the words host and guest come from the same stem, which contains both the g of guest and the h of host: ghostis. Hosts and guests play different roles, but they are actors in one “play,” a hospitable action. Ghostis also provided us with the word hostile, so close is the idea of hospitality to the possibility of animus lurking in either host or guest, or both. (A hostage is a person forcibly, and therefore discourteously, detained by a group not his own. Originally the word meant a person held as guarantee to a treaty of peace between two previously antagonistic sides.) A guest is an outsider who has been ritually “domesticated,” made temporarily part of the host’s domus, or house. He is given food, offered gestures of affability, and sometimes presented with gifts on his departure – for he must be free to leave. There may be genuine interest in him and delight in his company. But underlying the performance is the formal and primary aim of “disarming” him, of forestalling any likelihood of violence or resentment. The definition of money is a moving target. In as much as the famous speak for the age they live in, here a version of the course money takes from the ancient world to now. To ancient Rome, money was the essence and strength girding the empire’s central institution: the war machine. In the Age of Reason it was regarded with suspicion and was best when controlled and dispersed. In revolutionary America and England, money was a carrot at the end of a stick, and — for perhaps the first time — personified and rivaled man’s other – and perennial – best friend the dog. The Victorians had splintered views; the German and French regarded money as the root of happiness and of evil respectively; the British liked its function and prescribed – like proper bureaucrats – its place in the social order. 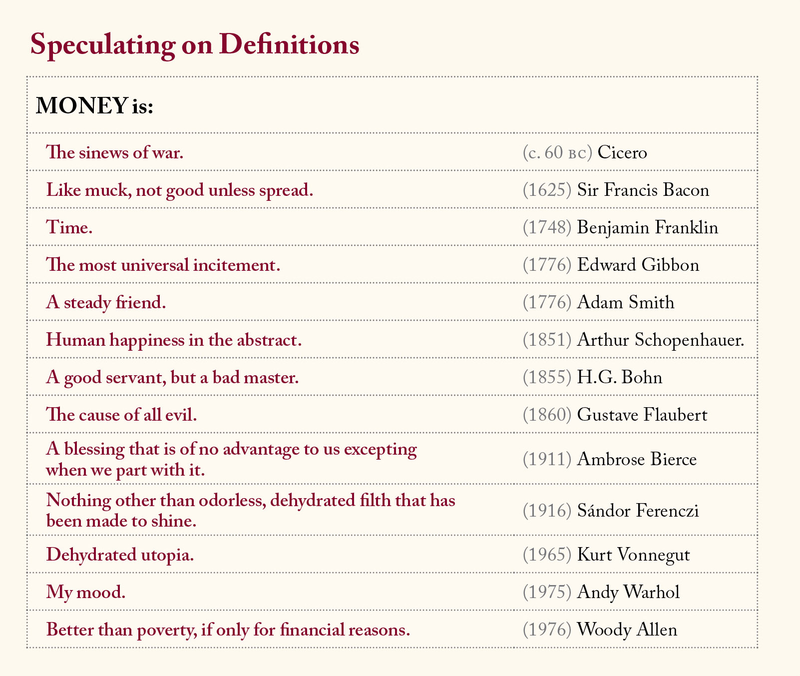 During the early 20th century and the first world war, money is an empty blessing and a filthy ruse propped up. 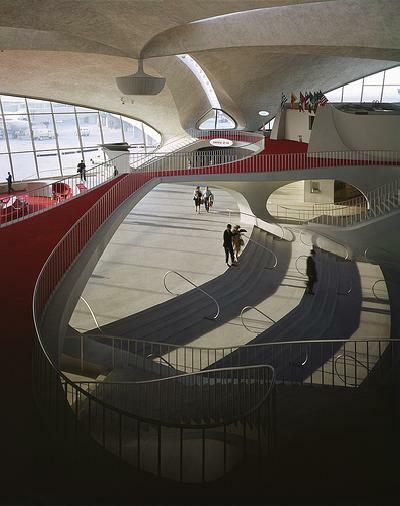 In the sixties, a collapsed ideal. And in the seventies another split: personal whim; and the better thing, if there’s a choice, but only as a default, and with conditions. In a competitive world, it’s a liability to be thoughtful. Takes too much time. People are cleaning up and moving on while you’re still wrapping your head around and making sense of and coming to grips with. Shall we stop the world and let you off? And how do you propose to fill out your timesheet? Here is a teacher who demonstrates to her class the difference between mere mental strength and mental character. The former computes and then decides – done. The latter negotiates a treacherous terrain: weighs conflicting options, hems, waits patiently, debates internally, haws, recalibrates biases, welcomes uncertainty. And it ends with wisdom. It’s a good definition, and – because of its difficulty – a better way to practical strength of mind. Ms. Taylor was always reminding the class of how limited her grasp of any situation was. “Sorry, I get distracted easily,” she’d say, or, “Sorry, sometimes I jump to conclusions too quickly.” In this way, she communicated the distinction between mental strength (the processing power of the brain) and mental character (the mental virtues that lead to practical wisdom). She stressed the importance of collecting conflicting information before making up one’s mind, of calibrating one’s certainty level to the strength of the evidence, of enduring uncertainty for long stretches as an answer became clear, of correcting for one’s biases. As Keith E. Stanovich, a psychologist at the University of Toronto, writes in his book “What Intelligence Tests Miss” (2009), these “thinking dispositions” correlate weakly or not at all with I.Q. 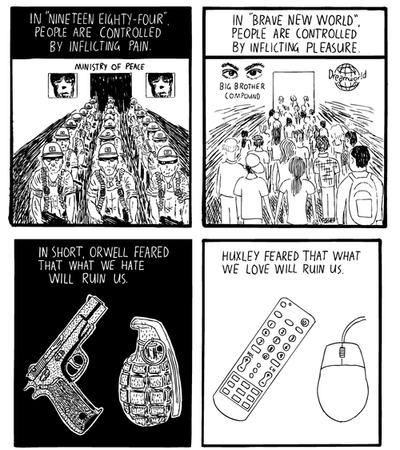 Stuart McMillen’s comic of Neil Postman’s Amusing Ourselves to Death, via kottke. Both visions are vicious and clarifying and true. Huxley’s though seems truer; it describes the insidiousness of our materialism and narcissism.